So on New Year's Day, I made the trek to Royal Oak to preview the route for the Beer Run on January 21 for the Southeast Michigan Runners Group. It was a cold and snowy day but I enjoyed previewing the course. I originally planned a run but it ended up being a bit short of the 5k mark so I went out again today and ran another route which is longer. The route on my Garmin ended up being 3.34 miles. Yes, I know it's longer than the 5k and if there are people that don't want to run the full route, it's set up ideally to cut some of it. When you come back on 5th street, you could turn down another street before getting to Connecticut to get back to fourth quicker. Just think of it as a new PR. Ha! Today started by parking right behind the Red Fox English Pub which is located at 11 mile and Main. Of course, the evening of the Beer run, this parking lot will not fit everyone but there is a parking structure one block away located on Center Street between second and third street. I took a picture standing by the Pub entrance so you can see how close it is. The pub entrance is at the back of the building and is on the second floor. Because of the traffic on Main street, the run will need to start across the street(on Main & 11 Mile) from the pub on the sidewalks since it's a busy street and it's only a few blocks to 4th street. Fourth street is a much better street to run on since you can run on the sidewalk as well as the side of the road opposite traffic plus it's not as busy. As you can see, we are still in the downtown area. We actually pass the Royal Oak Brewery as well on the run. As we get further down Fourth street, we get into the residential subdivision as you can see below. 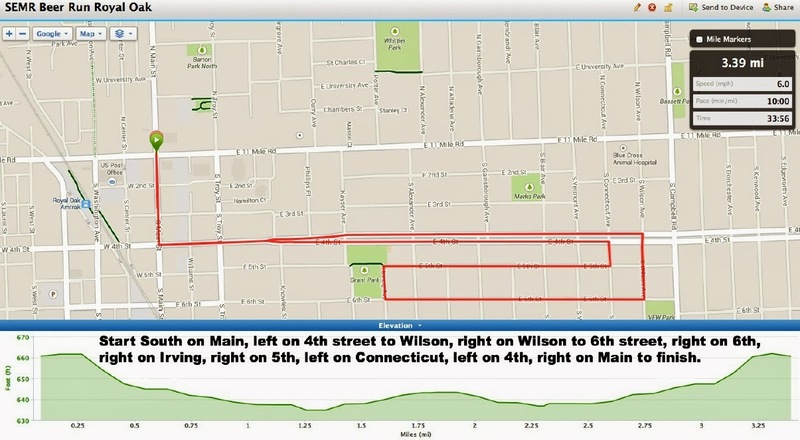 There are a few turns here and there all in the subdivision which is a nice area for a run. After the turns through the subdivision, we make our way back to Fourth street again heading back towards downtown. You can see below my footsteps from the first time I ran this. Of course, with as many people as we are expecting, the sidewalk and side of the street might be used with plenty of room to run. Finally, we make our way back to Main street and up to 11 mile to enjoy a nice beer or two and hopefully you will win one of the great prizes we will have to give away. Tomorrow or Wednesday, I'll do another blog post that highlights all the sponsors and prizes that I've been posting on the SEMR group Facebook page. We've got over 50 prizes to giveaway!!!! !